We love to have desserts whenever we are in Hong Kong. The Cantonese folks are very much dessert lovers like us, and they are extremely well-known for their assortment of 糖水 “tong shueis” which are both delicious and therapeutic at the same time. The desserts are available all year around, with a menu that changes with the seasons. Summer welcomes the ice blends and chilled items, most notably being 楊枝甘露 Mango Pomelo Sago which is immensely popular especially with the young to combat the heat. 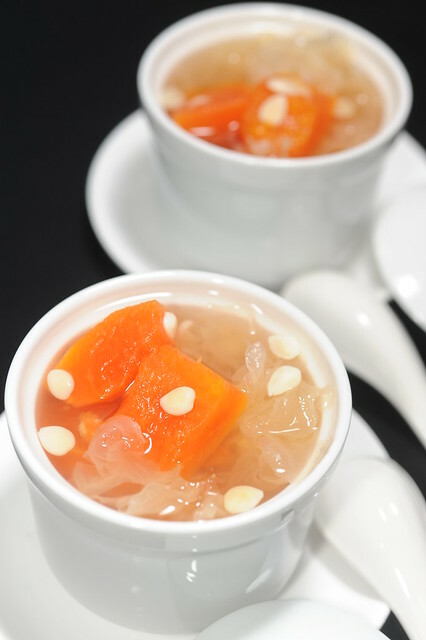 For those who are looking for more traditional desserts, there is 南北杏木瓜炖雪耳 Double-boiled White Jelly Fungus with Papaya which is not only sweet, but boast to have a hoard of beneficial properties like soothing the throat and clearing phlegm. As the weather turns cold, the hot desserts become immensely popular, be it the “paste-based” desserts like 芝麻糊 sesame paste, 花生糊 peanut paste, 核桃糊 walnut paste, 杏仁糊 almond paste or even a simple bowl of 番薯姜汤 ginger soup and sweet potatoes with 汤圆 glutinous rice dumplings to warm the tummy. 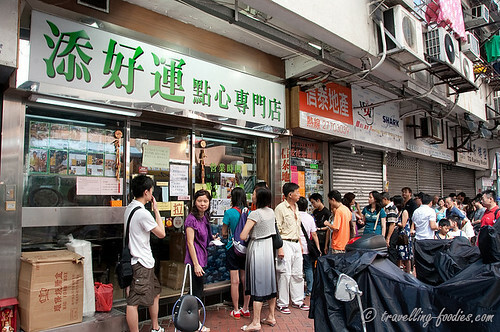 As such, dessert parlours and tong shuei stalls are found literally everywhere in Hong Kong. Strange it may sound however, one of the places to enjoy these sweet numbers is not at dessert joints like 許留山 Hui Lau San and 大良八記 Dai Leung Pak Kee, but at 牛奶公司 “dairy companies”. And to further bewilder the already perplexed, these “dairy companies” do not produce milk but are actually tea shops or cafes affectionately known to the locals as 茶餐厅 “cha tzan teng“. Now are you confused already? Singaporeans love soya beancurd. “Tau huay” as it is affectionately called here by folks from all races and walks of life, we eat it all the time, and quite literally! Traditionally, it is enjoyed as a breakfast treat piping hot, together with a warm glass of soyabean milk and a 油条 youtiao dough fritter for dunking in. Yet we see OLs queuing for them during lunchtime in the CBD area for a dessert after their midday meal, or as a takeaway for tea break later in the day. And as the day draws to an end, we see folks making a beeline for famous beancurd joints all over the island for communal supper, with friends and family. So you can see now how we truly love tao huay! “Rochor Beancurd” and “Selegie Beancurd” are some of the more familiar names and have since opened franchaises all over the island. And of course we have Mr Bean and Jolibean (alongside Old Chang Kee of course!) in literally every other mall and shopping centre of the heartlands. 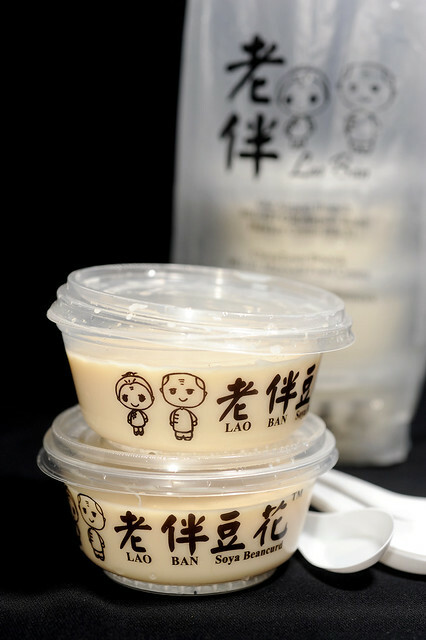 Amongst those which have made their way onto the Tau Huay Hall of Fame is surely 老伴豆花 Lao Ban Soya Beancurd. 南北杏木瓜炖雪耳, double boiled white jelly fungus with papaya and apricot kernels is an immensely popular Cantonese 糖水 dessert and easily one of my favorites! Not only does it tastes good, it is also also almost effortless to prepare! I remember vividly when I first had it on my very first trip to Hong Kong more than 10 years back. Accustomed to eating papaya raw then, I was very much intrigued to see it being cooked into a dessert when I first saw it. And boy o’ boy it was addictive! Since then, it has become a dessert which is cooked very frequently at home. Its good eaten warm, but I absolutely love it chilled overnight. Great for the current “summertime” weather! 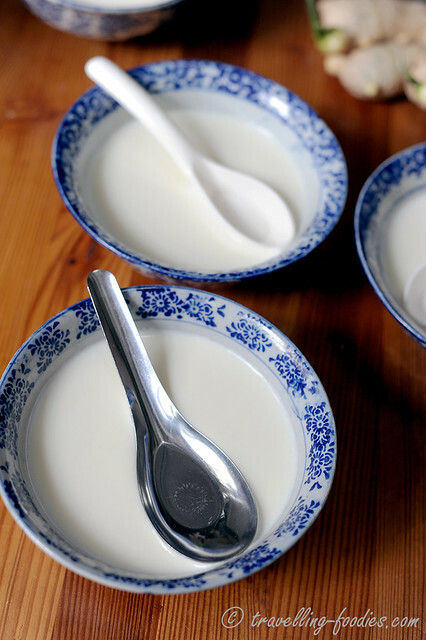 My family loves 糖水 tung shuei dessert soups. Be it a bowl of 绿豆汤 green bean soup to relieve the heat when the weather gets too unbearably hot for comfort, or 番薯姜汤 sweet potatoes in ginger syrup to warm the constitution on the cooler days, my mother never failed to whip up something for us to enjoy all year round. It can be as simple boiling red beans or green beans in a sugary concoction, or something that requires more ingredients and hence more work, like Lok Mei Tung 六味汤, better known as Cheng Tng 清汤 in Singapore. 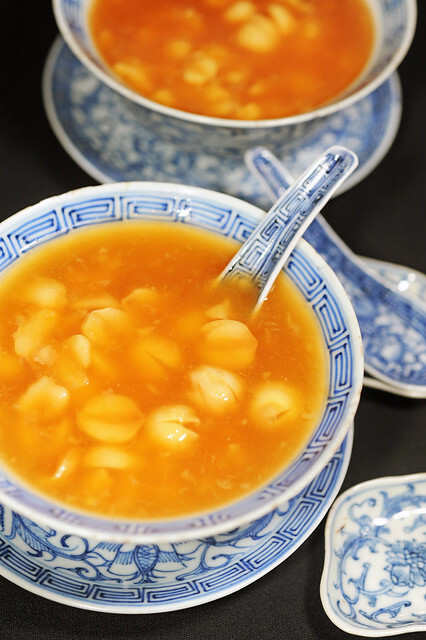 One of my mother’s favorites is Lotus Seed Soup 莲子羹, or more accurately since it has its roots in Teochew cuisine, Noi Jee Suãn 莲子爽, with an accentuation of the nasal tone on the last word. Despite liking it so much, my mother doesn’t make it often, partially owing to the laborious traditional procedure of preparing it, and of course lotus seeds ain’t no cheap commodity to start with. I guess that’s why its slowly diappearing from our neighbourhood chinese dessert soup stalls as well. Nonetheless, once a while she prepared it, but we as kids didn’t appreciate it much. We prefer Tao Suãn 豆爽 mung bean soup instead, as it comes with 油条 youtiao aka dough fritters which is good for dunking into the sugary soup or simply on its own. So Noi Ji Suãn is more of a treat for my mother to pamper and reward herself!